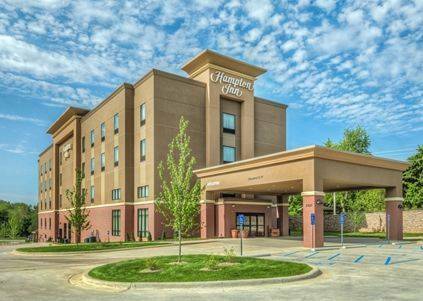 Boasting a peaceful location in a quiet setting the Hampton Inn Poplar Bluff hotel is only three miles from shops restaurants and entertainment in the city center. Situated just off Highway 67 our welcoming Poplar Bluff hotel offers fantastic connectivity to St. Louis Missouri and Little Rock Arkansas. We are also within walking distance of Three Rivers College and less than two miles from the new Poplar Bluff Regional Medical Center. Feel at home in a comfortable and modern guest room or suite equipped with free WiFi an ergonomic desk a flat-screen TV a radio alarm clock and a bar sink. Enjoy a peaceful night*s sleep in the clean and fresh Hampton bed before waking up to fresh-baked waffles fruit yoghurt and more at Hampton*s free hot breakfast buffet. If you don*t have time to stop just pick up a free Hampton*s On the Run Breakfast Bag Monday Friday. Plunge into the inviting indoor swimming pool or energize with the latest exercise equipment in the fitness center. With a 780 sq. ft. meeting room and a 24-hour business center this hotel in Poplar Bluff MO is ideal for meetings conferences and training sessions for up to 65 people. Our friendly staff will be on hand to make sure that your event is successful and hassle-free. Friendly service clean rooms comfortable surroundings every time. If you*re not satisfied we don*t expect you to pay. That*s our commitment and your guarantee. That*s 100 Hampton.